Don’t want to have to wait for your MacBook Slow Air? You can get the world’s thinnest laptop on eBay right now! Dreamhost, one web hosting company I use for non-mission critical websites, really screwed up this time. In an attempt to collect on all the bills that were due by the end of 2007, an automated billing script was run. The only problem was this script was run as if it was 2008-12-31, NOT 2007-12-31. Of course this meant everyone who had not prepaid their account an extra year received an email regarding a bill not due until 2009. Not a big deal, right? Just delete the email and ignore the mistake. 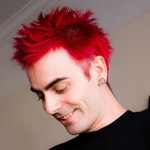 The problem is that Dreamhost’s automated billing system automatically charged cards that were on file for the accounts. They assure everyone that they are going through and making things right by cancelling these charges but no word yet on whether or not they’ll cover bank fees for those unlucky ones that had their account overdrawn. A lot of the time, people forget that the term “body modification” extends beyond tattoos and piercings. Plastic surgery, removal of misbehaving organs, and correction of damaged senses are all still under the umbrella of body modification. For years I’ve been wearing contact lenses because my vision is, shall we say, less than perfect. It’s not much of a hassle for me as I’m used to them and the cost is not a huge impact to my budget so when I heard about the different surgeries to fix eyesight I wasn’t running to get it done. But now that I’ve heard that LASIK surgery can improve vision beyond the normal 20/20, I’m much more interested. According to Slate, LASIK is pretty consistently providing people (primarily pro athletes) with vision better than 20/20 in almost 85% of people who get LASIK done with the new “wavefront” technology. As with any body modification, there are the risks of LASIK. These risks have been significantly reduced however, and studies show that under 1% of well-selected patients have complications. I’ve had a couple friends and family members (my mother who is a physician) undergo LASIK and for the most part I’ve heard good things. But please don’t consider this an endorsement or condemnation of the procedure. It’s your body, you need to weigh the risks and benefits before modifying it. And we would like to take this moment to propose that a number of frogs shall now be referred to as a “puddle of frogs”. Yeah, we made that one up, but who’s to say the other ones on the list weren’t just someone having fun? For awhile now I’ve debated starting yet another blogging project. One where I blog about current events, but set them up so that they are posted 5,10,15, or more years in the future, but on the same date. Basically taking the idea of time-shifting and applying it to a blog. Well it looks like someone’s doing something similar. 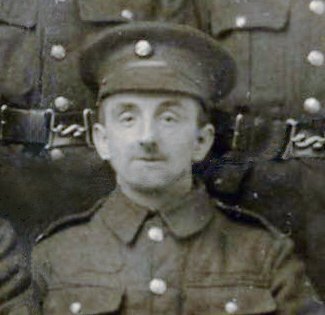 I came across WW1: Experiences of an English Soldier, a blog being written through the letters of a soldier in World War I. The posts are being published 90 years after the dates the letters were originally written by his grandson. The blog also contains additional posts with more information, pictures, and scans of things the grandson has discovered in his research of his grandfather’s life which, while they may destroy the purity of the concept, provide more context and back story. Definitely worth checking out, especially for those that are history geeks. I love GPS receivers. There’s something great about knowing exactly where you are, plus being able to track where you’ve been. They come in handy while hiking, walking around a city, or driving. And I have a very long history with these things. I used to have a carputer that combined a GPS receiver with software long before it was standard on cars. My carputer consisted of a shoebox+miniITX+LCD imported from Hong Kong. I’ve used a handful of GPS receivers that are meant to interface with laptops, but up until recently, have only owned one handheld receiver, a Garmin eTrex Legend (unless you count the Boost Mobile i415 or the Helio Ocean). 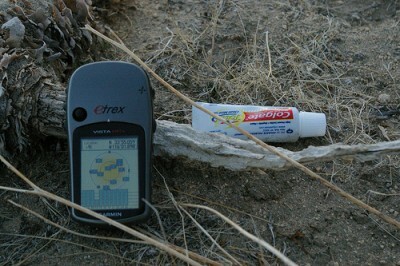 I loved that little device, it got me into geocaching and was primarily bought for that purpose. I used to also enjoy taking it on plane flights and tracking our flight across the country. It also rode shotgun with two other GPSrs during my cross-country move from Chicago to San Francisco. But I always felt like it was lacking. With only 8mb of internal memory, I could barely load enough maps for trips. I couldn’t even squeeze the entire Bay Area on it. And the monochrome screen? So 2002. I’ve been meaning to upgrade for quite awhile, and prompted by a New Year’s trip to Joshua Tree, I finally caved during a last minute trip to REI. I picked up a Garmin eTrex Vista HCx unit for $299.99 (you can get it cheaper, but I love REI’s return policy). It’s almost the same size as the old Legend, just a little shorter and fatter. The screen on it is gorgeous though. It’s amazing how much easier it is to read maps with colors. The best part about it though is the sensitivity of the receiver. With the old Legend, I had gotten accustomed to having to leave it on the dashboard in the car or carrying it in my hand while walking. It consistently complained about needing a clear view of the sky in order to lock onto satellites. The new Vista HCx scoffs at these needs. It was able to pick up satellites while stashed in the seat back pocket in the middle of my car! Amazingly it was also able to pick up a signal while inside! So armed with my new toy, we headed out to Joshua Tree. I basically left it on for the entire drive and most of the time we were out in the desert and it did a spectacular job of hardly ever losing a signal. It came in handy when trying to find our campsite that was a little over a mile from our cars and hidden amongst desert foliage that all looks the same. It also allowed me to keep tracks on where we went, whether it was climbing a mountain, scrambling over boulders, or even just wandering away from camp to *ahem* dig a hole. This tracking all came in handy when I got back home and wanted to geotag the photos I had taken out there. I loaded up EasyGPS to download a .gpx file containing the tracks and then used gpicsync (a Google Code project) to stamp the GPS information into the EXIF header of the actual image files. From there I uploaded the photos to Flickr, which automatically interpreted the GPS coordinates and placed my photos on the map. The other cool thing about gpicsync is that it will create a Google Earth file that will let you load up Google Earth and fly around the world, seeing where your photos were taken. Quite awesome when you’ve been taking photos in the mountains and you can actually see which ridge you were on in 3-D. So I highly recommend the Garmin eTrex Vista HCx. And no, they aren’t paying me to say that. :) Although, if you do want to pick one up, use this link: Garmin eTrex Vista HCx and Amazon will give me a few bucks. They’ve actually got a damn good price for it there.